We’re rebooting our concert reviews here on ArtFRONT.com after way too long of a hiatus. We’ll be looking for smart people who can write and have great taste and are astute about who and what to watch for on the nationwide concert scene at ALL levels from Major label to local acts. It’s just got to be really good!) ~R. 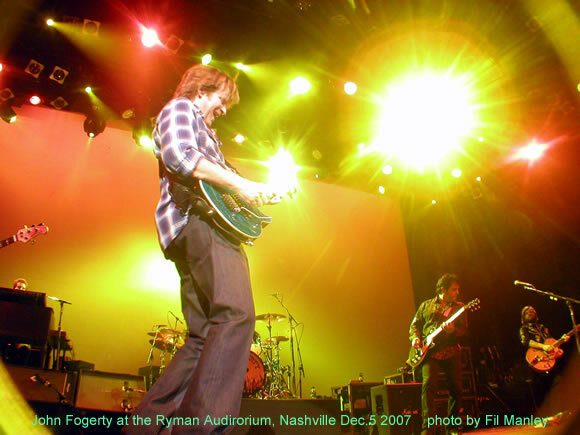 Fogerty at the Ryman. Yep that was badass. Really! ~R. Although it is not Creedence Clearwater Revival, his backing band is tightly knit and professional without being stiff or dragging on Fogerty’s Front Man persona and flash. The pure originality and structure of his songs protects the live performance from coming across like a lounge act version the way the first half of another Fogerty contemporary, Robert Plant and the Strange Sensation’s show at The Green Man Festival in Aug. of 2007 did before they finally seemed to figure out that the Audience wanted a more authentic version of the old Led Zeppelin songs and gave it to them. 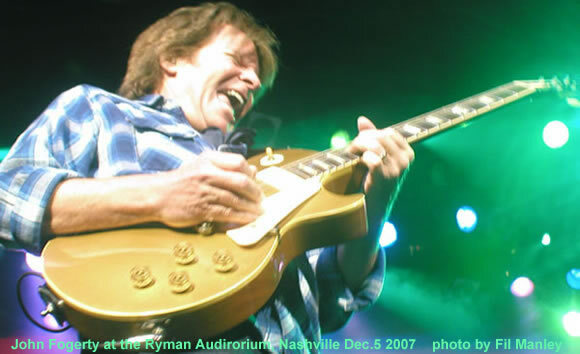 Fogerty’s set was C.C.R.’s pure distilled essence from the first song . The intermittent numbers from the new solo CD “Revival” were a bit more contemporary adult in nature but worked to serve as the mashed potatoes to the spicy gumbo jambalaya of all the Creedence songs that he assaulted the largely middle aged audience with.